In the darkened theater, a mother rocked her baby while another breastfed her little girl. 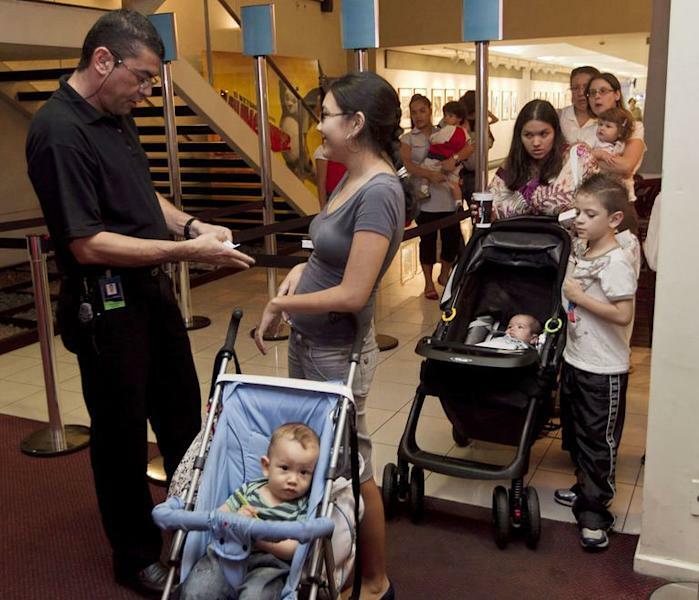 It's part of a new trend in Brazil where moms go to the movies with baby bottles, diapers and toys. "Getting out of the house with a baby requires a certain amount of organization," said Irene Nagashima as she placed her six-month-old Eric in a cloth baby carrier before the start of the show at a movie theater in downtown Sao Paulo. To overcome their isolation, young Brazilian mothers are revamping their social lives through the seventh art. Nagashima, a 40-year-old movie enthusiast, is one of the founders of Cinematerna, a non-profit group that encourages mothers to engage in cultural activities by offering them access to movie theaters decked out just for them and their babies. Nearly 20,000 mothers have signed up on the group's website, where they list their choices of films to watch -- no violence and no horror. Working with several movie theater chains in 14 cities across the country, the group offers special viewing rooms for babies up to 18 months old, with minimal air conditioning, night lights, diaper changing rooms and cushions with toys just about everywhere. "It's very nice, because when you have a baby, you're often stuck at home. This allows us to go out and meet other women in similar situations," said photographer Karin Araujo, 30. Her young Pedro first visited Cinematerna when he was six months old. At the time, he slept throughout the film. But now, aged 14 months, he walks and crawls all across the theater. "I barely see the film, but it's good for me to get out," beamed a smiling Araujo. A showing of tropical bird comedy "Rio," a 3D animated film, attracted about 40 adults with half as many babies. Some fathers came too. The film had barely begun when the first babies cried. A baby girl calmed down by suckling on a breast while her mother watches "Rio" silently and attentively. The mom-baby film experience, a project launched in 2008, also hopes to cement bonds between new mothers who meet up afterwards to have coffee and share their thoughts, explained 39-year-old Alexandra Swerts, another founder of Cinematerna. 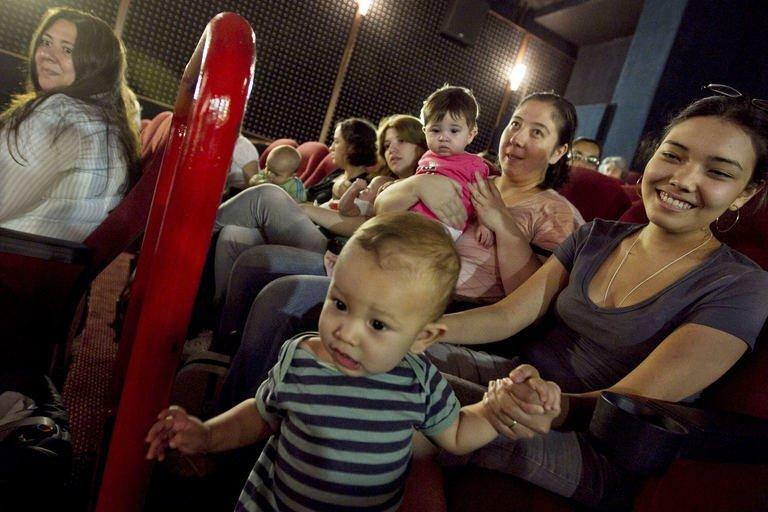 "It's going to be easy today," said an optimistic Fatima, the grandmother of eight-month-old Teo and Ligia, after the twins arrived asleep to the movie theater. Her respite was short-lived, however, and she soon dug deep into her huge bag to take out baby bottles to soothe the crying babies.